Yun Hi Chala Chal Raahi…..
Last month, while returning from Mussoorie, I stopped at a small manual jaggery manufacturing unit along the highway. 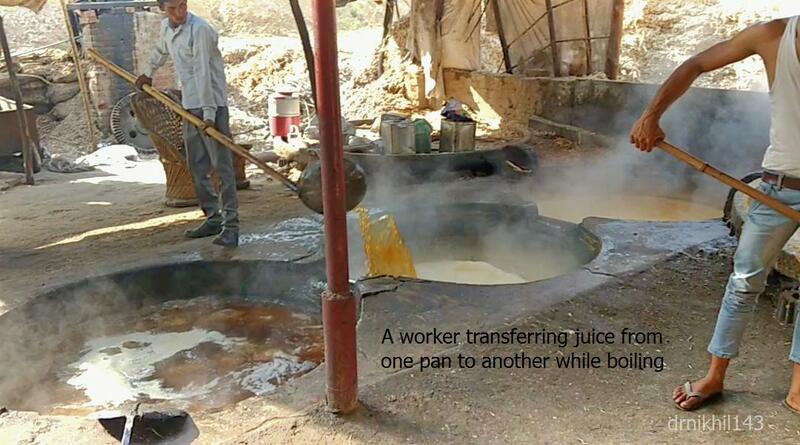 I asked them about the process of making jaggery, took some photos and also recorded a video. 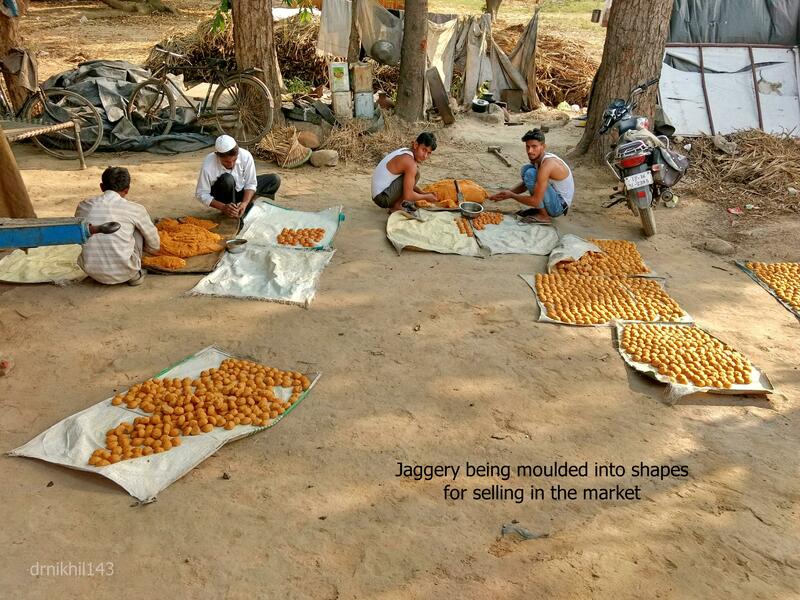 In this post, I’ll be telling you how jaggery is made. You can view the video on my YouTube channel drnikhil143. Jaggery or Gur is made by boiling and concentrating sugarcane juice. 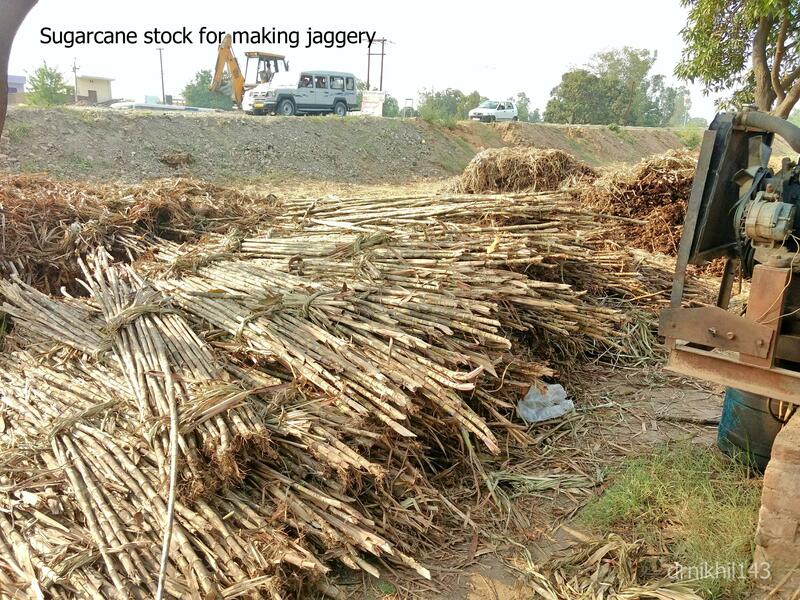 Sugarcane industry is quite well developed in India and plays an important role in Indian economy. 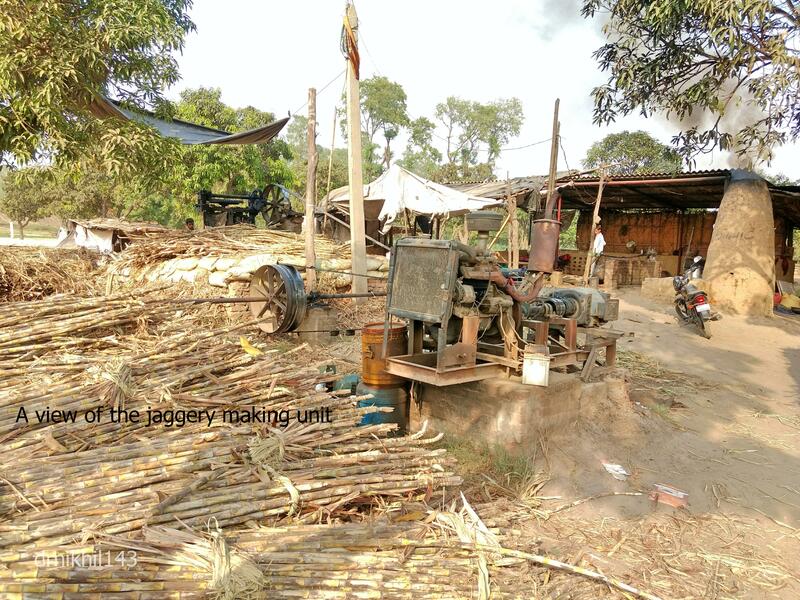 Today there are numerous automated jaggery plants but still manual manufacturing is also carried out widely. It is a simple process and doesn’t requires any heavy machinery. It is a good source of rural employment in sugarcane producing regions like U.P, Maharashtra, Gujarat, etc. 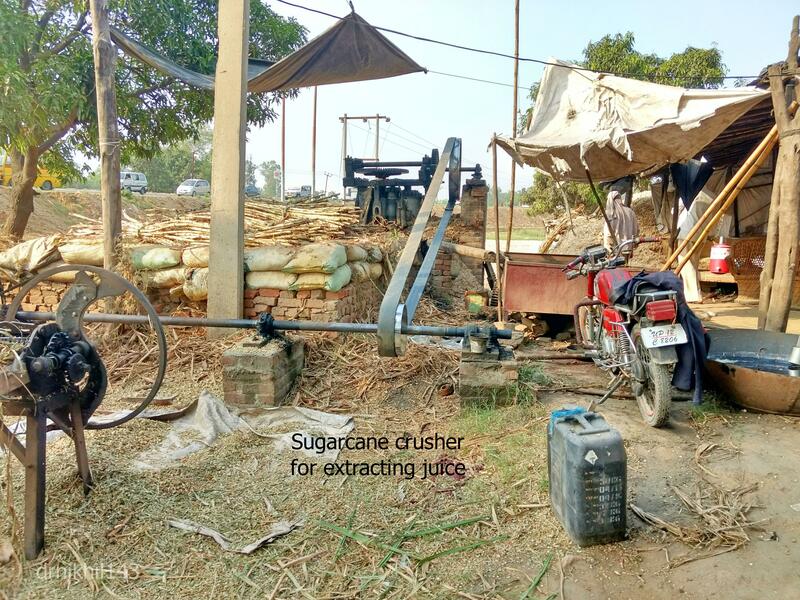 Firstly, the sugarcane is crushed in a big crusher to extract the juice. The juice is then transferred to a settling tank to separate the dirt and impurities. The filtered juice is then put into large thick and shallow iron boiling pans kept over furnace. 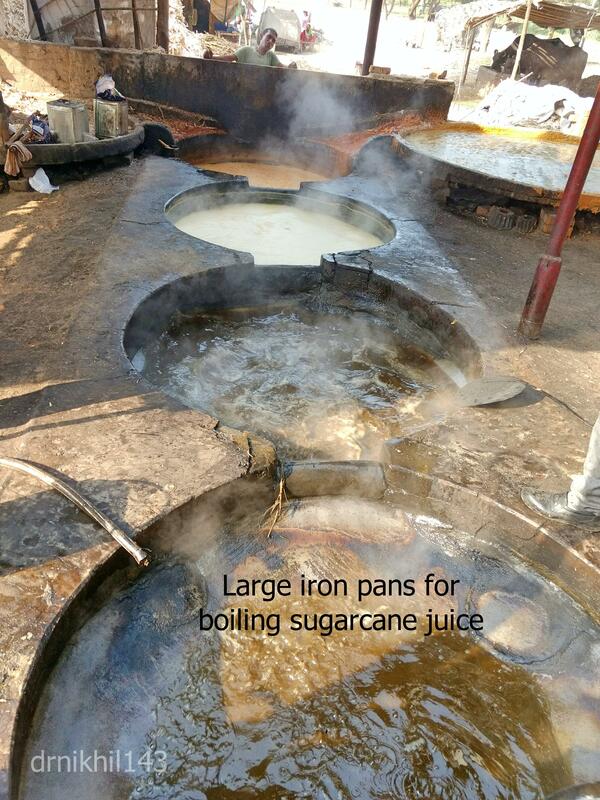 The sugarcane juice is boiled while being stirred continuosly so as to avoid it sticking to the pans. While boiling, impurities which come to the surface of juice are removed continuosly. The juice is transferred from one pan to another while boiling. In this process the impurities which settle down are also removed. Boiling continues for few hours till the juice thickens into a golden brown paste.. The paste is then transferred to a large flat pan to cool down. Here also it is continuosly moved to avoid sticking and to get a desired consistency. It is then moulded into different shapes and packed for selling in the market. 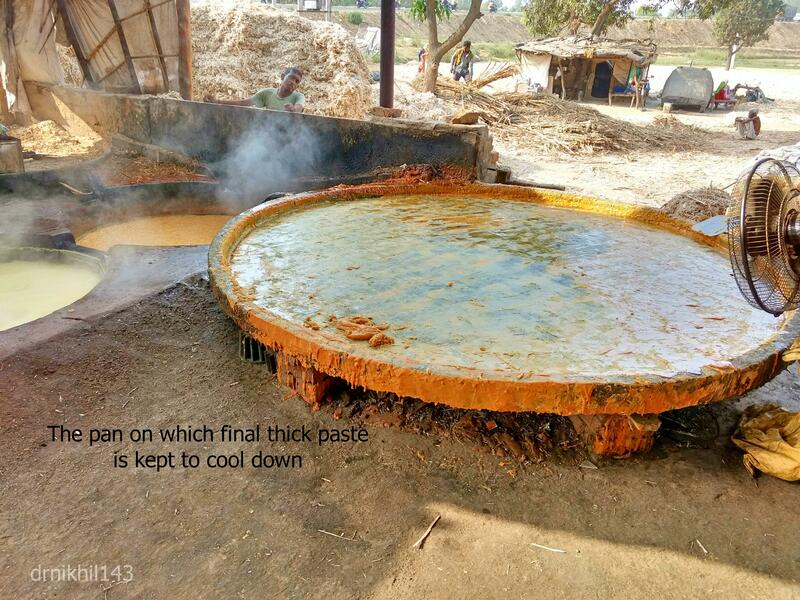 Jaggery making is a simple but laborious process. This kind of manual unit doesn’t requires huge investments and can be set-up relatively easily. Jaggery or Gur is a pure, unrefined and healthier form of sugar. It is also rich in iron as some iron gets absorbed into it from the boiling pans. Jaggery is consumed as it is and also used in making of many sweets. Jhajjar is a district in Haryana state of India. It was carved out of Rohtak district in the year 1997. It is actually Mata Bhimeshwari Devi temple, located in a small town named Beri, of Jhajjar district. It is commonly known as Beri wali mata ka mandir. The temple is around 55-60 kms. from Gurgaon and takes about 1.5 hrs by car. The road to Jhajjar is a very good 4 lane highway. Driving was a breeze as the weather was quite pleasant. It was named Bhimeshwari devi due to the installation of the idol of the goddess by Bhima during the period of Mahabharata. Every day the idol of devi is taken from an outer temple to inner temple at around 12 pm and then back in the evening. This ritual has been going on since the period of Mahabharata. Mata Bhimeshwari is regarded as the Goddess of happiness and success. Every year lakhs of people visit this temple. Maximum crowd comes during the Navratras, which occur twice a year in the months of Chaitra and Ashwani (according to the Hindu calendar). During Navratras, there is a huge fair and hundreds of shops are beautifully decorated. Newly married couples come here to re-tie the nuptial knot once again before the goddess. Mundan ceremony (first hair cut) of the male child is also done here very commonly. In the same comples, there is also a temple dedicated to Lord Shiva. The whole temple complex was under renovation during our visit. This temple can be easily reached by buses, train, taxis, or by private vehicle. There are many shops outside the temple, selling prasad and toys for kids. Enough parking space is available. This is a famous shrine located in Mubarakpur village, about 5 kms. from Farrukhnagar in Gurgaon district of Haryana. This temple ia around 20-25 kms. from Gurgaon and takes about 40 minutes by car. Thousands of devotees come here to take the blessings of the goddess. Devotees offer prayers to the goddess and light diyaas at a designated area. There are also few other small temples in the same complex. A big fair is organised every Wednesday, which is visited by locals and tourists. Wednesday is called Budhwaar in hindi hence the name Budho Mata mandir. There are shops selling prasad, various snacks, and toys for kids. There is a pond in the temple complex. People take out some mud from the pond and worship as a ritual. Here also maximum crowd comes during the Navratras. Enough parking space is available in the vicinity. There is one small Budho Mata mandir in Jhajjar also but it is not so famous. This is a cattle hospital, established in the year 2013 by Shri Sunil Nimana. It is located on Jhajjar-Gurgaon road, Jhajjar district, Haryana. It is spread over few acres of a leased land and continuosly expanding. It is first of its kind in Haryana. Thousands of sick and injured cows and other cattle are brought here and given excellent medical treatment. They have excellent facilities and a dedicated team for the treatment of cows. Anybody can report a sick or injured cow at their ambulance number 8816809191. This hospital is run privately with the help of public donations. You can also make your contributions for the welfare of cows. Shri Sunil Nimana can be contacted on his personal no. 9813820938. I will be writing a more detailed post about this Cow hospital on my another blog Ye Soochna Janhit Me Jaari. Sultanpur National Park is located in Gurgaon district of Haryana on Gurgaon-Farrukhnagar Road. It is about 15 kms. from Gurgaon and makes a nice weekend getaway for the people of Gurgaon as well as Delhi. This is a paradise for bird lovers. It is famous for vast variety of resident and migratory birds which come from Europe, Siberia and Central Asia during winter months. Sultanpur lake was given the status of Bird Sanctuary in the year 1971 and later upgraded to the National Park in 1991. It takes about 1.5 to 2 hrs. to have a full round of the park. You can also spot Neelgai(Blue bull), deer and Black bucks. It is advisable to carry a binocular for bird spotting. Rosy Pelican Tourist Complex is run by Haryana Tourism and provides very good facilities for stay among the lush greens with sweet melodies of the birds. There are good facilities for food, water, toilets, and vehicle parking. 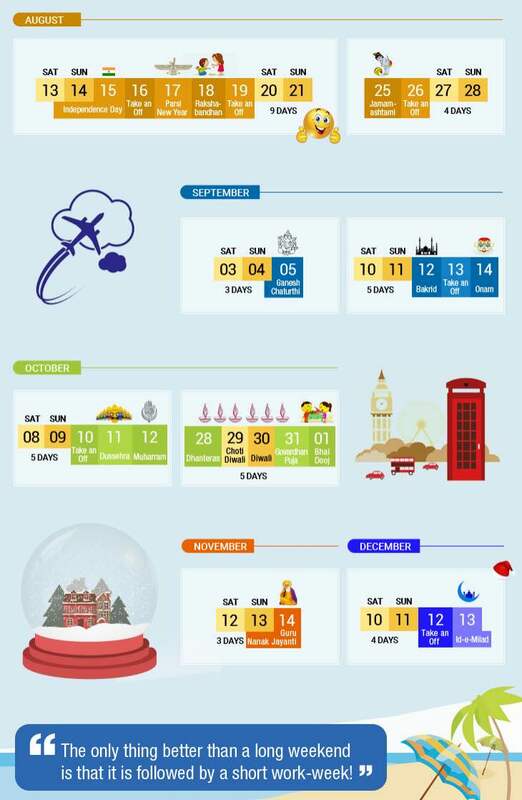 December to February is the peak season for visit. The park is closed on Tuesdays. It is also closed during most of the summer months. For this reason we couldn’t watch any birds this time. For more information you can check Haryana tourism website. Please follow my blog and keep coming for more interesting posts about travel and food!! Though I have traveled to many places in last few months but it has been a long time since I have written any post. Two months back I went to Tamil Nadu for 10 days, covering Chennai, Kodaikanal, Madurai and Rameswaram. There are many more nice places to see in Tamil Nadu which I’ll be travelling to later. All these four cities offered a lot to cherish and share. This one was my second solo trip (first one was to Hyderabad in November last year, which I’ll try to post asap). I had some amazingly unique experiences on this trip. Out of ten days, I spent 4 days in Chennai, 3 in Kodaikanal, 1 and a half each in Madurai and Rameswaram. I planned it quite well taking lot of help from TripAdvisor reviews. I pre-booked all my travels and hotels in advance. It was a medium budget comfortable trip and I spent roughly Rs. 30000 including airfares from Delhi. I traveled short distances by trains, local buses as well as cabs, stayed in good hotels and ate at lots of famous restaurants. There was NO shopping at all. For someone on a tight budget, the whole trip could be done for around Rs. 20000 without missing much fun. And if you are more people, many expenses can be shared too! Climate : Tamil Nadu has tropical climate…summers are quite hot (from March to July-Aug), winters are pleasant (Nov to mid Feb, a light jacket is enough), and it usually rains during March and Aug to Oct. Best times to visit are Oct-Nov and mid Jan-Feb as it would be pleasant in most parts. Hill stations like Kodaikanal can be quite cold in winters and moderate rest of the year. Best advice would be to check latest weather updates before planning as rains can be uncertain sometimes. Connectivity : Chennai and Madurai have international airports with good connectivity. Whole of Tamil Nadu is very well connected to rest of the India with a great railway network. Last mile transportation can be done easily through buses or taxis. Language : Tamil is the main language of Tamil Nadu. There is good level of literacy and a lot of migrant population as well so you will find many people speaking Hindi and English. If you can speak English there won’t be much problem as a tourist. Food : South Indian food comprises many dishes, not just Dosa-Idli. It is very tasty but quite spicy, can be little difficult for foreign tourists on longer trips. Popular vegetarian dishes include idli, vada, dal-vada, dosa, utappam, rice varieties, ragi dishes, sambhar, rasam, malabar parotha, etc. Thali system is very popular for main meals among locals. A large population of Tamil Nadu eats non-vegetarian food which includes fish, sea food, chicken, meat, etc. In addition, all big cities have multi-cuisine restaurants to cater the needs of all. Their Filter Coffee is so amazing that you will want it again and again. Though all fruits are consumed in plenty but Banana is the most popular. Here you will get many varieties of bananas varying in sizes and colour. Soon, I will be writing reviews of all the places where I ate on TripAdvisor. There are numerous beautiful huge temples all over south India, constructed hundreds of years ago. They are quite similar in architecture and made of huge dark greyish stones with immaculate carvings. Many have beautiful colourful paintings depicting gods and goddesses. It is astonishing to see the high level of accuracy and workmanship in the times when there were hardly any tools available. And the structures stand up so strong even after hundreds of years, unshattered even by natural forces. The symmetry, use of geometry and practicality is really unbelievable. In most temples you will find a huge wooden entrance door, tall brass pillar, statue of the Nandi (the holy bull) and idols of various deities, gods and goddesses. 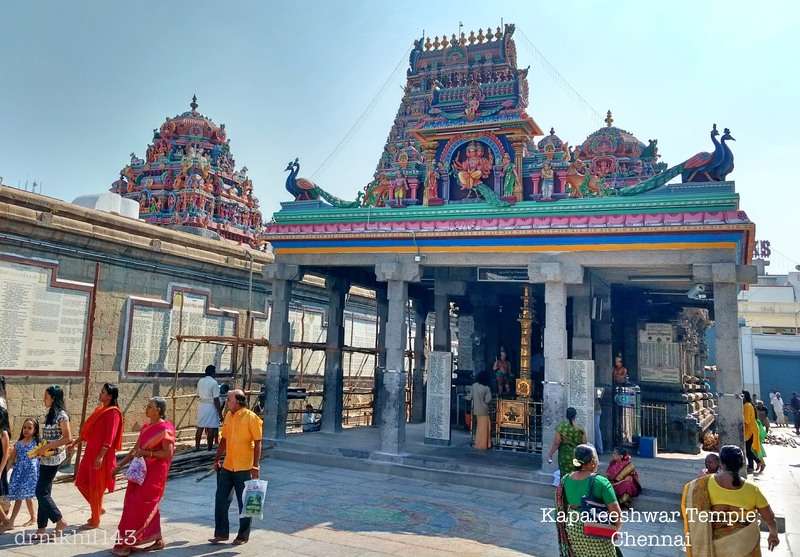 In Chennai I went to Vivekananda House and many well known temples namely Kapaleeshwar temple, Padmanabhaswamy Temple, Sri Sai Baba temple, Tirupati temple, Isckon temple and Parthasarthy temple. I also volunteered for a turtle walk which is organised by a group involved in conservation of Olive Ridley turtles. It was an awesome experience. I also visited Mahabalipuram which is about 55 kms from main Chennai city. Kodaikanal is a beautiful hill station in Tamil Nadu, at height of around 2000 metres(approx. 6500 feet). It is a very green and peacefull hill station, not too much crowded, and has various tourist spots and amazing places to satisfy your taste buds. Madurai is an ancient yet quite modern and well developed city of Tamil Nadu. It is known for very famous Sri Meenakshi Amman Temple, dedicated to the goddess Parvati, and there are many other beautiful temples. There is also a Gandhi Museum, which houses various photographs and things used by Mahatma Gandhi. It also includes a part of the blood-stained garment worn by Gandhi when he was assassinated. Rameswaram is a small town located on Pamban island in Tamil Nadu. It is famous for Shri Ramanathaswamy Temple, which has great significance for hindus in India. It is one of the Char Dhaams and also one of the twelve Jyotirlingas of Lord Shiva. There is also famous Pamban railway bridge(first sea bridge in India) and beautiful Dhanushkodi beach. There’s a lot of information and wonderful pictures. I’ll cover my trip in few individual posts. 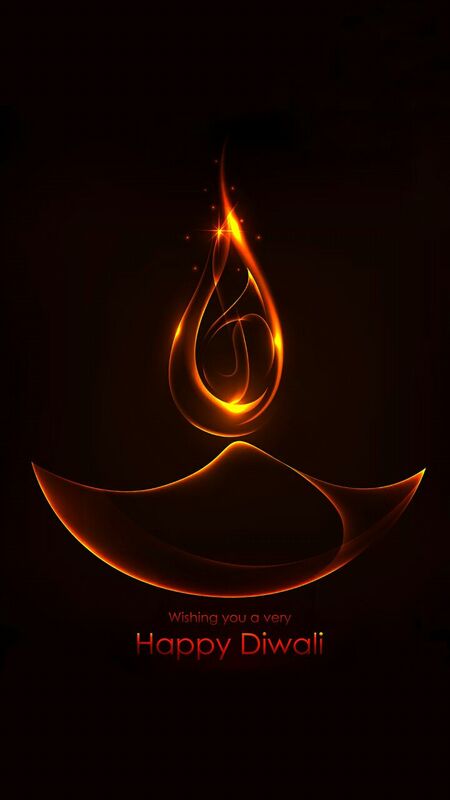 Today is Diwali – the festival of lights. Light the second lamp and let it burn away unwanted greed and desires… feel happy and contented with what you have been blessed with. Light the third lamp and let it fade away all insecurities that you may have in your mind related to anything or financials; just beleive that God has given u life and he will surely give you enough to survive. Light the 4th lamp and carry that lamp to each part of ur body; let it burn away all your diseased cells or any disease in making. Feel healthy as this lamp travels to each body part and illuminates each organ. The 5th lamp is a miniature of the Sun… nothing but the divine light… light it in the centre of your body and let it fill the warmth and love inside your whole body…feel one with the Divine… let the love and warmth filled inside you ooze out of you through your smile…eyes..speech…and body….carry this love with you through out the day…u will find that everyone who meets you is happy and elated. This is the biggest blessing that whoever meets you becomes happier after meeting you… this will also make you happier in return. 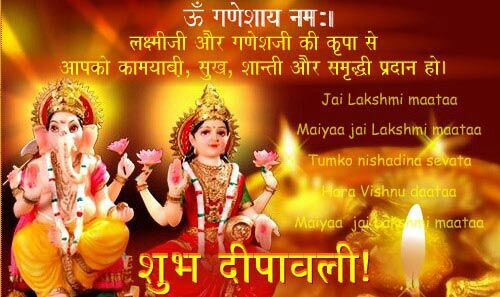 Wish you a very happy Diwali…. Jet Airways has now introduced new wireless streaming in-flight entertainment service to excite you with an exciting range of Indian, Hollywood, regional and international movies, famous TV shorts, video games and music to suit every mood and taste. All you need is a compatible Wi-Fi device like a smartphone, tablet or a laptop with a few easy steps and you’re ready to go! JetScreen can easily be accessed on a Wi-Fi enabled (802.11g/n) smartphone, tablet or laptop. To use this service on smartphone or tablet, Airtime Player app is available for Apple and Android devices only. Laptops will require the latest version of Adobe Flash Player and the Widevine Media Optimizer plugin. 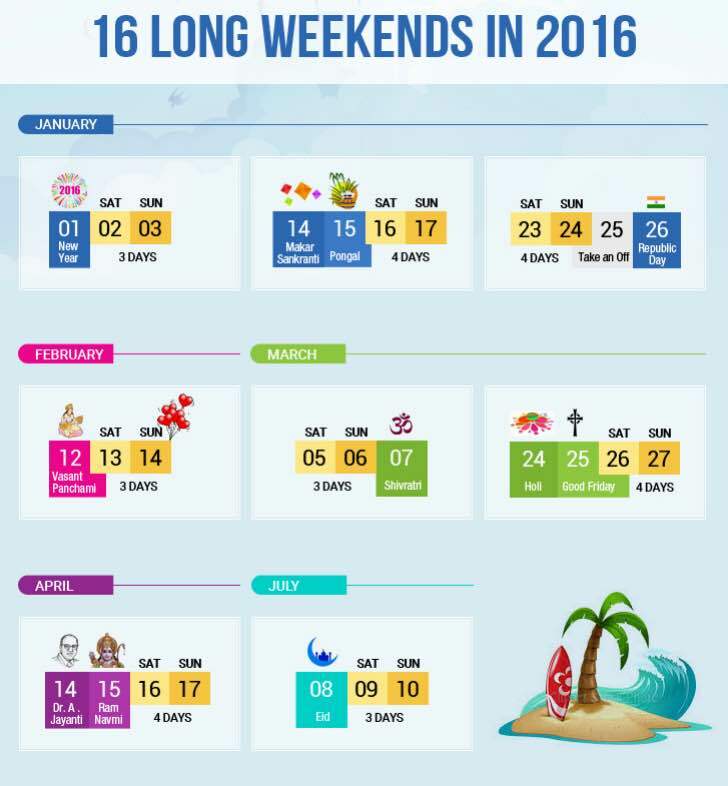 For more details visit Jet Airways. Vacation plans will soon be swinging into high gear. And with an increasing number of people travelling abroad, there’s no better time than now to make sure your next trip is a healthy one. If you will be travelling across time zones, ask your doctor about the best way to manage your medication schedule. Should you take your medicine at the usual time for your home time zone? Should you switch? If so, how? Be sure to take enough of each medication with you, so you don’t have to worry about finding a pharmacy and filling a prescription on your trip. Keep a copy of your prescriptions with you in case your medication is lost and you need a replacement. Also, ask your doctor how your medications may react with the new foods you may eat on your trip. Ask your doctor to write down any medical problems you have and how they are being treated. Add the names (including generic names) and doses of any drugs you may be taking and how you take them (whether you need a syringe and needle, for example). If you are travelling abroad, this will make your trip through customs much smoother. It will also make getting replacement medications easier if you lose any. Make a copy of the list – keep one in your suitcase and another with you at all times. If you’re travelling by airplane, place all medications in your carryon instead of your checked luggage, to prevent them from being lost or stolen. Keep your medications in their original containers while travelling. If you have heart disease, keep a copy of your most recent ECG (electrocardiogram) with you as well. If you experience any cardiac problems on your trip, such as shortness of breath or chest pain, it can be difficult to determine changes if an ECG is not available for reference. Older adults should wear compression socks when they travel – according to some studies, they may be able to reduce the risk of DVT (Deep Vein Thrombosis). If you are travelling somewhere for the first time, it’s a good idea to identify a local hospital, clinic or physician ahead of time – one that will be able to meet your specific health needs, should you need to seek treatment on your trip. If you are travelling abroad, the consulate or embassy in that country should be able to recommend an appropriate hospital or clinic. The International Association for Medical Assistance to Travelers can help connect international travellers with doctors and clinics as well. You may want to consider purchasing a temporary supplemental insurance plan if you are travelling outside the country. Check with your health insurance provider to see in which countries, if any, you will be covered when overseas. Healthcare abroad can be expensive. Medicare and most major insurance providers do not cover service outside India. Retired military personnel should check if their healthcare is covered in the country in which they will be travelling. Use sunscreen on a daily basis. Water-resistant sunscreens work well for a trip to the beach or for a hot day, when you may sweat a lot. Apply sunscreen 30 minutes before going out into the sun. Re-apply every two hours after that. Using approximately one ounce of sunscreen (about a shot-glass full) every time you apply, will ensure maximum protection. You might also consider purchasing a wide-brimmed sunprotective hat. We need to drink more liquids during the hot summer, so consume plenty of cool liquids (fruit juices can help, too). Remember to stay hydrated especially during air travel, when the air is particularly dry. By the time you feel thirsty, you may already be slightly dehydrated. So, take water every time the flight attendant asks if you’d like a drink, and avoid excessive alcohol consumption, which will dehydrate you. Traveller’s diarrhea is the most common health complaint of travellers to foreign countries. It is usually bacterial in nature and can be treated with antibiotics that can be provided by a travel medicine specialist (who should know which antibiotics work best in which parts of the world). Consult your doctor for more information. Use a hand sanitizer before meals and ask your hotel or tour operator for safe places to eat – food at international hotels is usually safe. Drink bottled water, and use the same to brush your teeth as well. Cruise ships present unique risks, including noroviruses, which have been associated with outbreaks of diarrhea and vomiting. Handwashing and use of hand sanitizers before meals and after touching surfaces in common shipboard areas may help you avoid this problem. Carry emergency contact information with you in case of an accident or a sudden illness so that family members can be easily notified of your status. The best way to ensure a fun travelling experience is: To consult with your doctor ahead of time and make sure your immunizations are up to date. P.S. Taken from an article in Health and Nutrition magazine. 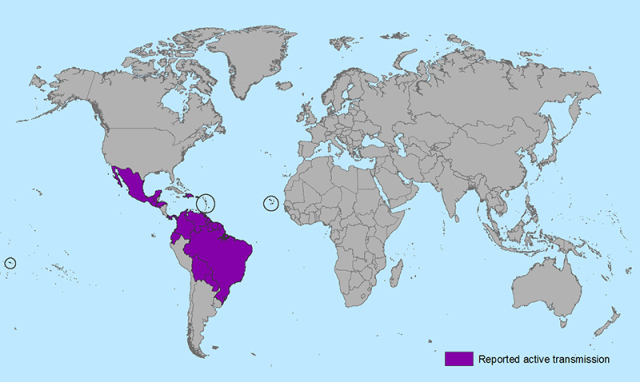 Zika virus is spread to people through bite of an infected Aedes species mosquito(same mosquitoes that spread dengue and chikungunya viruses). The illness is usually mild with symptoms lasting from several days to a week. About 1 in 5 people infected with Zika virus become ill. Severe disease requiring hospitalization is uncommon. Deaths are rare. Aedes mosquitoes typically lay eggs in and near standing water in things like buckets, bowls, animal dishes, flower pots and vases. They are aggressive daytime biters, prefer to bite people, and live indoors and outdoors near people. Dutchie and I had prepared that someday we might have to (temporary) leave the Netherlands to pursue one’s career. 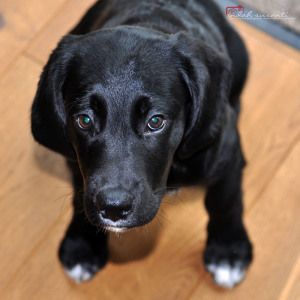 Thus, when the opportunity came, the first thing we did was extensive search on the best company to fly our Labrador-mix dog, Dante, from Rotterdam (the Netherlands) to Minneapolis (USA). Since his weight was 25 kilograms (55lbs), he could not join us in the cabin. We had to check him as “baggage” or as cargo. Wishing all my readers a very Happy New Year! 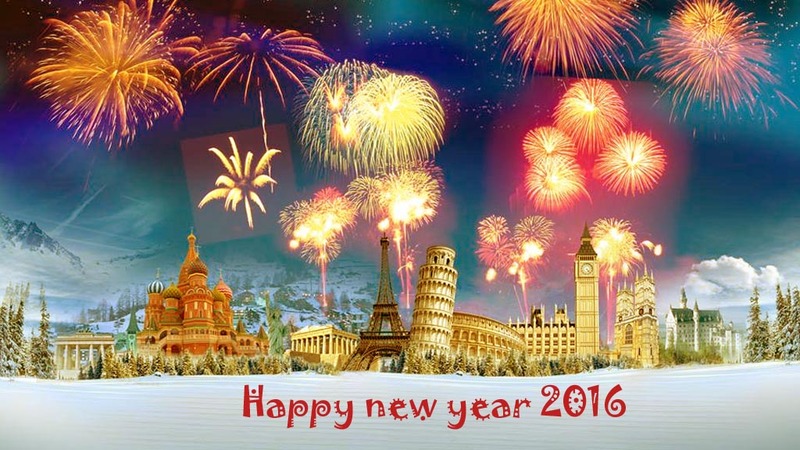 May you all have best of the travel experiences throughout 2016 and beyond. A San Francisco cable car holds 60 people. This blog was viewed about 650 times in 2015. If it were a cable car, it would take about 11 trips to carry that many people.